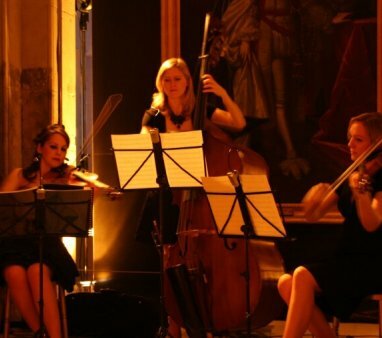 Topaz is a stylish female string trio comprising two violins and double bass. 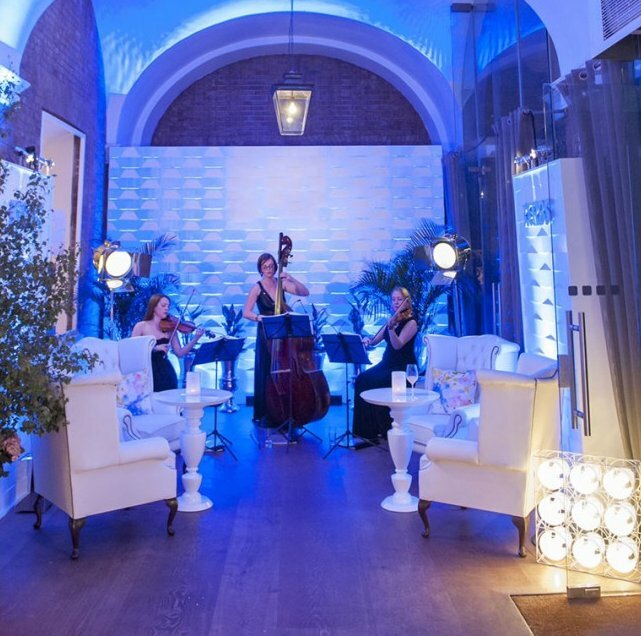 They can also provide the stunning Topaz female quintet (4 violins and double bass), perfect for larger events or any occasion for high impact, and an eye catching alternative. They arrange all repertoires themselves creating original versions of well-known music. This also means they can arrange any piece on request no matter how unusual! 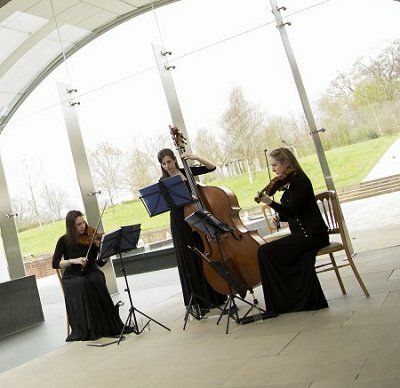 Topaz provides a unique and memorable experience for weddings, corporate events and private functions, with exciting background music or The Topaz Performance. Elegant, sophisticated and versatile, They are available to perform on both acoustic and blue electric instruments. Trained at London’s finest music conservatories including the Royal Academy of Music, Topaz fuse classical instruments with pop and jazz styles. Topaz performs music from a diverse and extensive bespoke repertoire ranging from Bach to the Black Eyed Peas. The exclusive Topaz Performance is also available as another option! Select from one of their themes (e.g. James Bond, 80’s, Love Songs) or you can even create your own bespoke performance by choosing your favourite tracks. Available as Trio and Quintet. 2 x 45 minutes sets. Found what we were looking for! 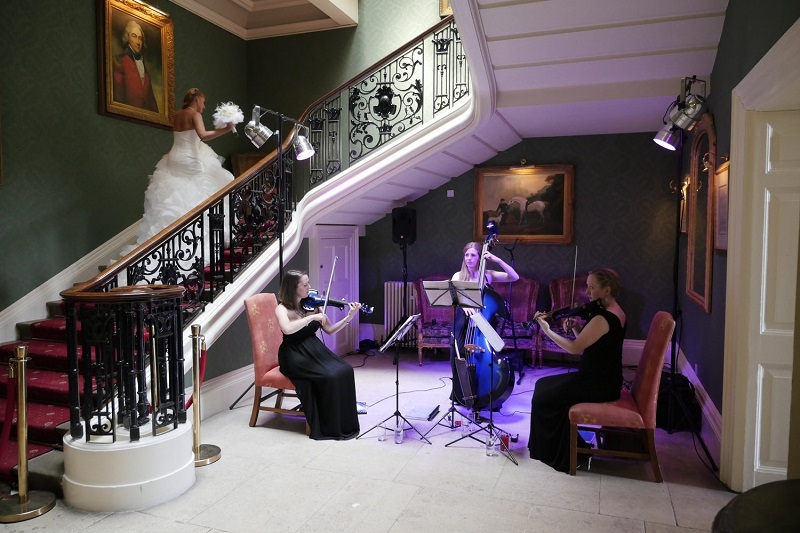 Having trawled all the usual string quartets, swing and jazz bands, looking for music for the wedding, we knew as soon as we listened to the samples on your website that we had found what we were looking for! We wanted something a bit different, slightly unusual, but absolutely fantastic, and that is exactly what we got. A huge thank you to Topaz. 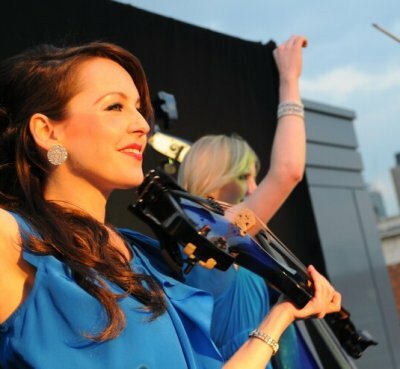 They provided excellent entertainment last night at my event at Tower Bridge and my client was thrilled with the music. A lot of guests commented on how contemporary and fresh the music sounded. They looked amazing and were a pleasure to work with. Topaz sounded great, looked great, was easy to work with and the repertoire was perfect for the occasion. I enjoyed every single note!